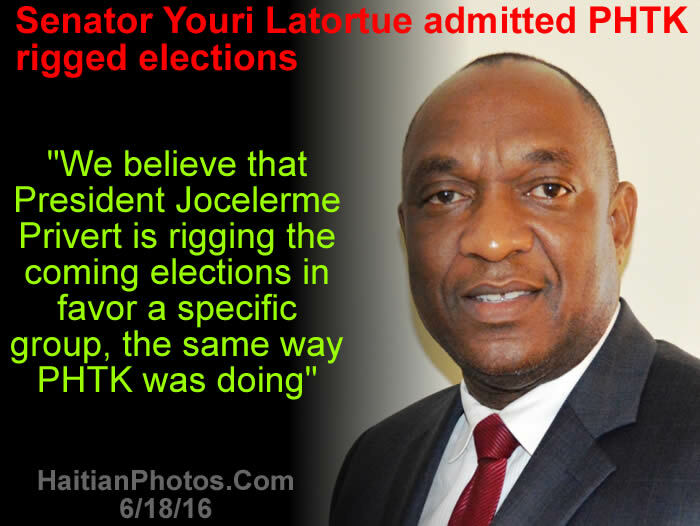 Senator Youri Latortue who was an adviser to president Michel Martelly admitted that PHTK had rigged the elections of August 9 and October 25, 2015. He is afraid the provisional president of Haiti, Jocelerme Privert is attempting to do the same thing that PHTK did by rigging the coming elections toward a particular group. As per the news dated June 19, 2016, Youri Latortue, the Senator of Ayiti An Asyon (AAA) and former advisor to former President Martelly has finally admitted that Martelly's political party PHTK had rigged the elections on August 9 and October 25, 2015. And he did not stop here. He has further warned, he believes that President Jocelerme Privert is planning to rig the coming elections in favor a specific group in the same way as PHTK did". Youri Latortue is an outspoken senator and one of Haiti's most powerful politicians. He was a lieutenant in the Haitian Armed Forces (FADH). It is a known fact that he was involved in many of the political killings carried out during the 1991-94 coup, in particular the shooting of Father Jean-Marie Vincent in August 2004. According to the testimony and reports of many colleagues, Latortue is a gang godfather, drug-trafficker and death-squad leader. He is the big boss of Gonaïves who has helped bring down Haitian governments several times. In a 2007 cable published by Wiki Leaks, it was learned that U.S. Ambassador to Haiti Janet Sanderson described him as "the poster boy for political corruption in Haiti." His eminence Cardinal Chibly Langlois doesn't think for a moment that all these candidates interested in the upcoming election in Haiti are for real. Last weekend, while he was in the city of Alcibiades Pommayrac to celebrate a Mass, the Haitian Cardinal announced that he has doubt that those who declared their candidacy for the upcoming election have any interest in serving the people. According to him, these candidates are looking for a well-paid job with all the benefits associated with it. His eminence Cardinal Chibly Langlois is not hesitant. On May 1, while celebrating a Mass in the multipurpose room of Lamandou in the city of Alcibiades Pommayrac, he has expressed his doubt over the proclaimed purpose of the candidates participating in the forthcoming election. Their interest is more about earning money than serving the nation. They are mainly looking for a well paid job with every benefit associated with it. Chibly Langlois is a Haitian cardinal of the Roman Catholic Church and the President of Haiti's Bishops' Conference. He has been the bishop of Les Cayes since August 15, 2011. On February 22, 2014, Pope Francis has elevated him to the College of Cardinals. Aristide Supports Lavalas Candidate Narcisse. Hordes of excited Haitians streamed alongside the campaign vehicle of Maryse Narcisse, riding with former President Aristide in a parade to mark the end of her campaign for president. Narcisse is running under Aristide's Fanmi Lavalas, one of 56 candidates vying for the top job. Most of the crowd was from slum Cite Soleil and are Lavalas supporters, one of whom says "It's the party that knows the pain of the Haitian people." Here is a picture of the 5 Independent Members of the Verification Commission. 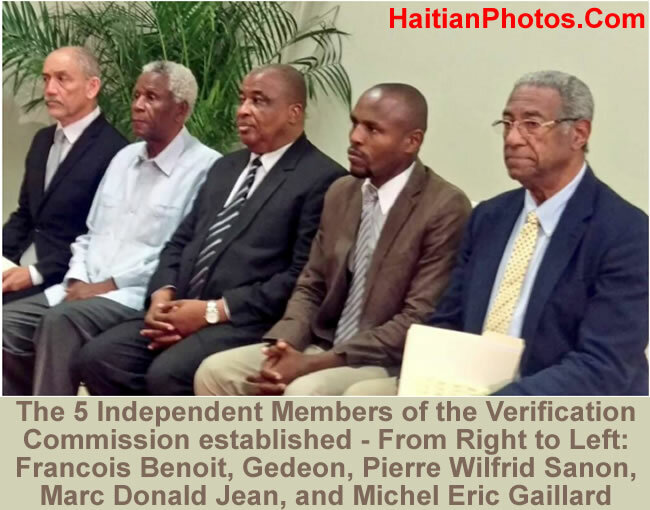 The 5 Independent Members of the Verification Commission established - From Right to Left: Francois Benoit, Gedeon, Pierre Wilfrid Sanon, Marc Donald Jean, and Michel Eric Gaillard. On Thursday, April 28, 2016, at the National Palace, the Provisional President Jocelerme Privert accompanying the Prime Minister Enex Jean-Charles installed the 5-member Independent Commission for Electoral Evaluation and Verification (CIEVE). The main objectives of installing this commission are, reviewing previous election processes and results, electoral court decisions, and restore confidence and trust before moving forward with the unfinished election. The five members of the Commission are: (1) Mr. François Benoît, the leader, and former member of the Provisional Electoral Council (2005-2006); (2) Mr. Gédéon Jean, former member of the Independent Electoral Evaluation Commission created by presidential decree dated December 22, 2015 (under the Martelly regime); (3) Mr. Pierre Wilfrid Sanon, designated by the Haitian Association of construction companies; (4) Father McDonald Jean, appointed by the Anglican Church (former senator and member of the Council of the Wise in 2004); and (5) Mr. Michel Eric Gaillard, designated by the Order of Chartered Professional Accountants of Haiti.  Here is a picture of Mr. Francois Benoit, President of Verification Commission. 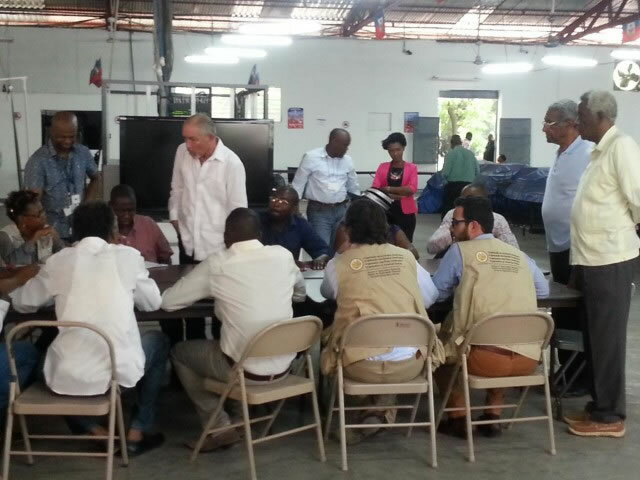 Pierre Francois Benoit, the leader of the Independent Commission for Electoral Evaluation and Verification (CIEVE) has completed the audit of last election and concluded the findings of the commission after a month long review. As per his report dated May 30, 2016, after an examination of 25% random sample of the roughly 13,000 tally sheets from polling stations, the Commission has noticed about 628,000 untraceable votes. Lot of votes could not be traced to a voter or to a group of voters. It has been observed that often number of untraceable votes in the polling stations have surpassed the legitimate votes. Out of the total valid votes of 1,560,631 about 29% or 448,000 voters were untraceable and 180,250 were with fake CIN, making a total of 628,000 or 40% of total valid votes (1,560,631). It was further noticed that first place winning president candidate received more number of untraceable votes than the combined total of such votes to second and third place winners. The CIEVE has recommended throwing out the disputed results of last year's first-round presidential election and restart from zero, because it appeared to be tainted by fraud. As per Benoit, it appeared electoral fraud was masterminded at a "high level." 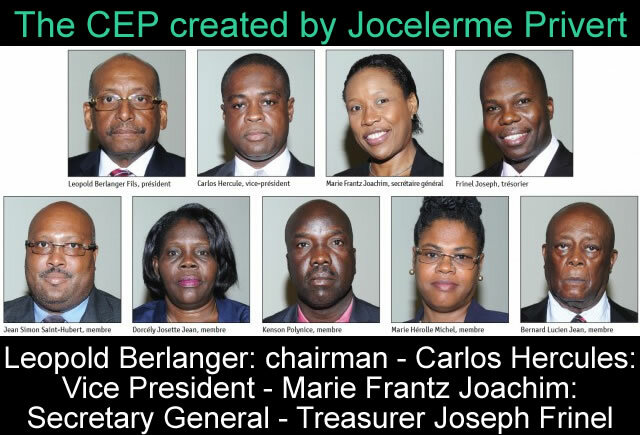 Here is a picture of the CEP created by Jocelerme Privert with Leopold Berlanger: chairman - Carlos Hercules: Vice President - Marie Frantz Joachim: Secretary General - Treasurer Joseph Frinel. On Wednesday, March 30, 2016, at the Court of Cassation (Champ-de-Mars), the 9 members of the Provisional Electoral Council (CEP) were appointed by the interim President Jocelerme Privert. Léopold Berlanger representing Press sector and Carlos Hercule, representing the Episcopal Conference of Haiti were elected as the President and Vice President respectively. At the meeting with the Provisional President Privert on 19 April 2016, the new CEP submitted their proposed plan of actions that should be implemented for achieving the remaining election process. Their proposed agenda included: assessment of the function of electoral machinery, dialogues with the government, civil societies, and between the CEP on implementing a more transparent and strict management of the election process, reinforcing autonomy within the CEP, reopening of the relevant municipal records and the modernization of the electoral system. Prime Minister Jean-Charles Enex, and the Minister of Finance, Mr. Yves Romain Bastien were present in the meeting with their respective high officials. Among the points discussed include: the budget of the future elections and discussion on the CEP's fund requirement. May 30, 2016 - A Verification Commission headed by Pierre Francois Benoit reported that the elections conducted on October 25, 2015 was characterized by significant fraud and professional misconduct. "After digging into it, we started seeing a pattern where a lot of votes could not be traced to a voter or to a group of voters. 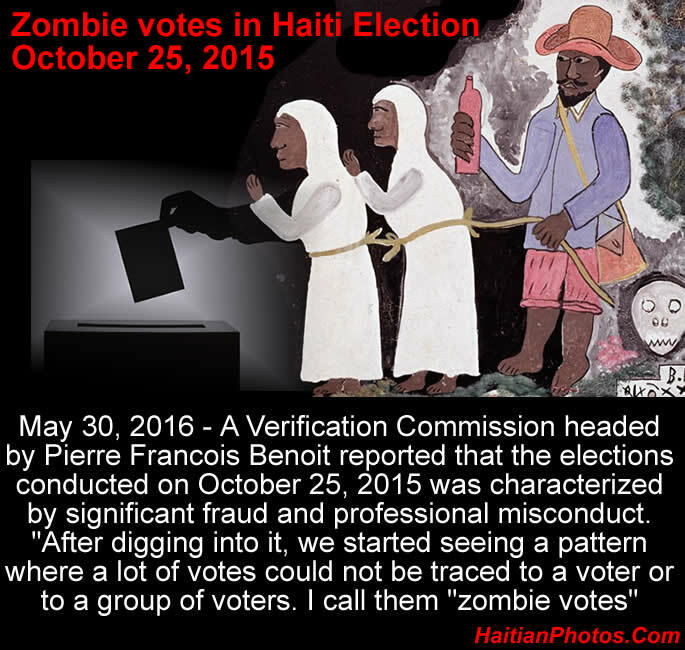 I call them "zombie votes"
On the evening of May 30th, 2016, Haiti's Independent Commission of Electoral Evaluation and Verification (CIEVE), a five-member team led by a businessman, Francois Benoit, who is a former ambassador to the U.S, released its long-awaited report on the controversial Washington-supported Haitian elections of August 9 and October 25, 2015. The audited report of the five member panel reveals that "the electoral process was marred by serious irregularities, grave inconsistencies, and massive fraud, because only 9% of the total vote cast has been found to be valid." The members of the CIEVE have reviewed 3,235 voter tallies (procès verbal), i.e., a 25% random sample of 12,939 total votes cast. Their concern includes the complete lack of female officials elected. However, as per the Commission, at least one woman Nétlande Pierre Dérius of the Artibonite did indeed win by popular vote and her case along with 21 other legislature contestants should be remanded to a special electoral court for reinstatement. 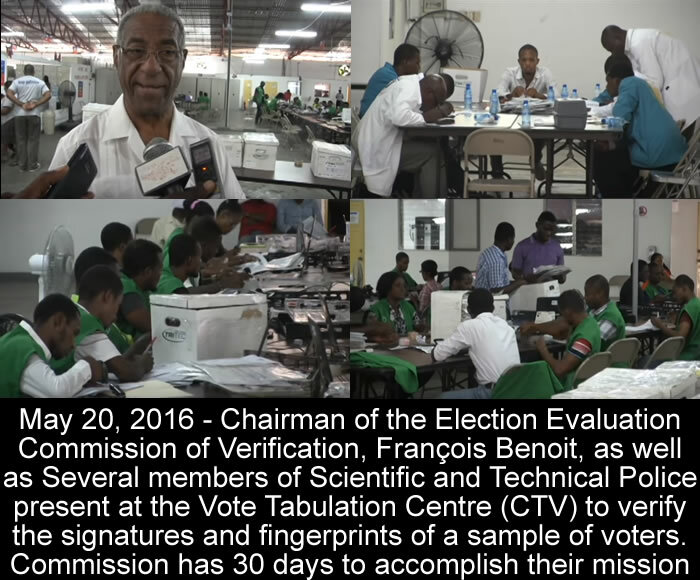 May, 20, 2016 - The chairman of the Election Commission of Verification, François Benoit as well as Several members of the Scientific and Technical Police were present at the Vote Tabulation Centre (CTV) to verify signatures and fingerprints of a sample of voters. The Evaluation Commission has 30 days to accomplish this their mission. 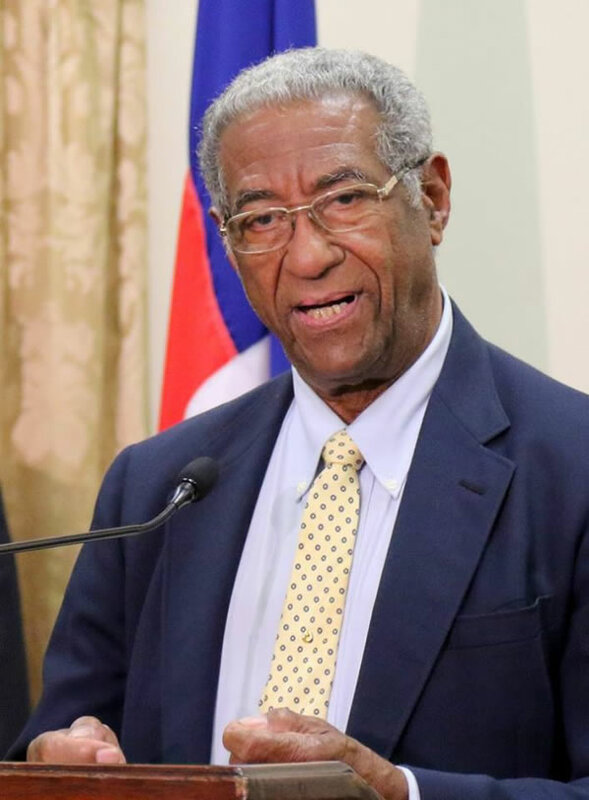 In last April, on 28th, the interim President Jocelerme Privert installed an Independent Commission for Electoral Evaluation and Verification (CIEVE) with the objectives of reviewing previous election results and electoral court decisions, before moving forward with the unfinished election. It was decided that the commission would conduct a random sample survey of 25% of the roughly 13,000 tally sheets collected from the polling stations. The submitted Report of such Independent Commission on May 30, 2016, audited by a five-member panel, led by a businessman, Francois Benoit, who is a former ambassador to the U.S, shows that out of the total valid votes of 1,560,631 about 29% or 448,000 voters were untraceable, because they did not fill the required "procès-verbal de carence" which were meant to be filled by the representatives of political parties and election observers who were on duty, entitled to cast votes at the polling stations where they were engaged other than where they were registered to vote. The number of fake CIN numbers (as per National Identification Card) written by hands was 180,250 or 16.2% of the vote cast, because the signatures or fingerprints recorded at the voting centers do not match with the records on the CIN cards. For the 1,112,600 traceable votes, 180,250 were with fake CIN, making a total of 628,000 (448,000 + 180,250) untraceable votes or 40% of total valid votes (1,560,631). The commission has further observed that often number of untraceable votes in the polling stations have surpassed the legitimate votes. The commission has noticed that number of untraceable votes received by the first-place candidate, according to the results of the CEP, was higher than the total number of such votes received by the second- and third-place candidates and it was higher than the difference between the first- and fifth-place candidates. The CIEVE has recommended rejecting the last year's first-round presidential election because it appeared to be tainted by fraud. As per Benoit, it appeared that electoral fraud was masterminded at a "high level." However, the final decision whether to redo the election will have to be made by a reconfigured Provisional Electoral Council. Here is a picture where several members of the Verification Commission took over the Tabulation Center. On Thursday, April 28, 2016, the Provisional President Privert installed the 5 members Independent Commission for Electoral Evaluation and Verification (CIEVE) to establish credibility of the 2015 election results and restore confidence and trust to participate in the upcoming elections. On Thursday, May 12, 2016, over 60 experts from such commission visited the Tabulation centers to take control over the situation and start their challenging tasks to check the compliance of the voting process, polling and counting in accordance with the Electoral rules. They are working under close observation of the representing political parties. Earlier, it was decided that since it is not possible to check every vote cast by 5.8 million registered voters, the commission would audit the last election process through a 15% random sample. However, as per the recent decision to avoid large sampling error, the sample size has been increased to 25%. 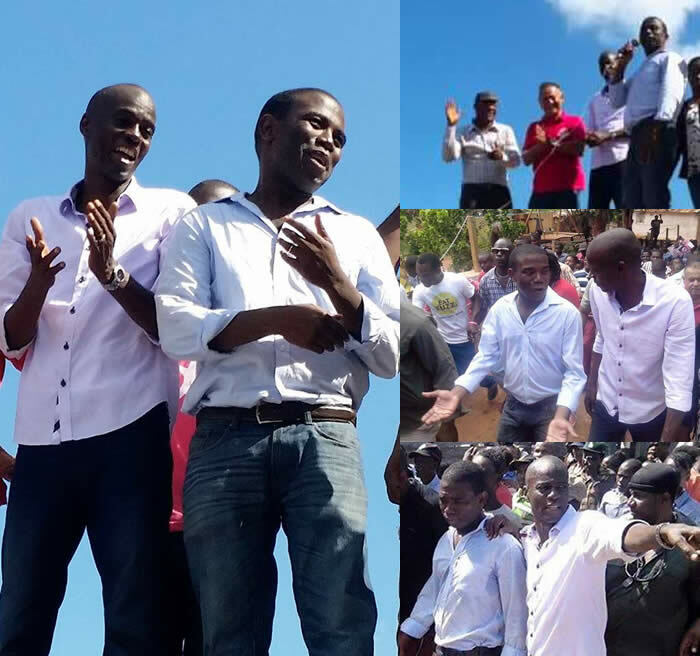 Here is a picture of former rebel Guy Philippe as he supporting Jovenel Moise as candidate for President of Haiti. In last January, former Senator and coup leader Guy Philippe threatened to divide the country unless then President Martelly leaves his office within February 7, 2016 deadline. The U.S. Drug Enforcement Agency has a longstanding arrest warrant against Philippe over charges of cocaine smuggling and money laundering. Furthermore, the Human Rights Watch has accused him of extrajudicial killings and he has alleged involvement in the recent attack at the Les Cayes police station which resulted in the death of a policeman, four attackers, and injuries to five officers. He is a former Tonton Macoutes leader and a suspended Haitian Police Chief. Guy Philippe is popular and has a stronghold in the southern part of Grand' Anse Department. He has endorsed his support for former President Martelly's handpicked presidential candidate Jovenel Moise.